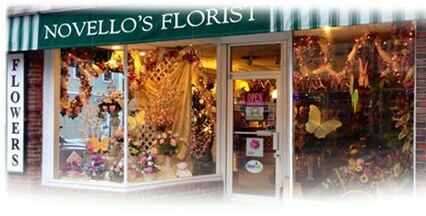 Since 1977, Novello's Florist has been proudly serving Danvers, MA and its surrounding communities from its one location. We are a family owned, full service florist dedicated to providing prompt and highly personalized service. Customer satisfaction is our specialty. We take pride in creating each floral design with the utmost care. At Novello's, every customer is important to us! We are closed Sundays, except for funeral deliveries ordered by 2:00 p.m. on Saturday. Our shop serves the following areas: Danvers, Beverly, Boxford, Hamilton, Hathorne, Ipswich, Lynn, Lynnfield, Marblehead, Middleton, Peabody, Salem, South Hamilton, Swampscott, Topsfield, Wenham and West Boxford. If you have any questions or need more information, please contact us directly at 800-683-6674. Local customers dial 978-774-4010. You can also email us at: customerservice@novellosflorist.com. We're always here to serve you and make your flower-sending experience a pleasure. A delivery fee starting from $7.95 will be added to each order, for each address, based on the delivery zip code. For Sunday funeral deliveries please call the flower shop directly at 800-683-6674. If desired, please call the flower shop directly at 800-683-6674 to inquire on the availablitiy of specific products.